I miss knitting on you. I know that when you arrived in the mail, I (practically) tore through the Tyvek envelope with my teeth to free you, balled you up immediately, swatched, and cast on within the hour. There is just one thing keeping me from you, and we both know what that is. Sweater Swap 2010: A Twist Cardigan for Meghan, from the Stitch It! Podcast. Meghan's sleeves. I honestly don't remember the sleeves on my own Twist taking this long. I blame the fact that Meghan is taller than I am, Cece. Every row on this pair of sleeves is like an eternity away from you. What I'm saying, Cece, is that while knitting cables feels more appropriate for the practically Canadian weather we've been having in California, I'd rather be knitting you. But I will tell you one thing, Cece. If your sleeves take HALF this long, you're going straight to time out. Don't say I didn't warn you. It's OK! I totally talked to her on the phone yesterday, and we decided if I pick up sale yarn of an appropriate nature, we'll totally get together for a Girl's Knitting Weekend. Cece is way cool like that... Also, today's Comment Word Verification: "rotorti". I'm working on my Twist too, but stopped at the buttonhole band because I'm not sure what buttons I'll use. But the sleeves seemed like they took a long time, even though the sweater is for my short-armed cousin! You always crack me up Jasmin. Your CeCe looks great so far! LOVE the color! 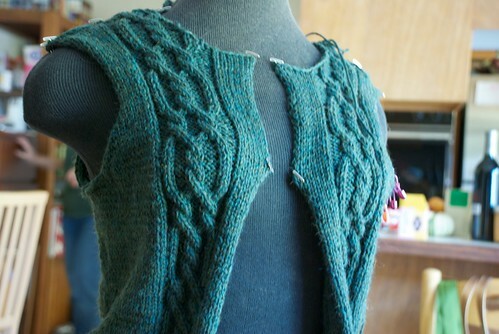 I am just finishing the body on BMB's Eyelet Cardi and I sent her over here to read your post. Can't be taking any chances.